Almost 40 years after its first annual assessment of the global economy, the Forum’s 2018 report uses new methodology to understand the full impact of the 4IR, and finds factors including human capital, agility, resilience, openness and innovation becoming increasingly important. 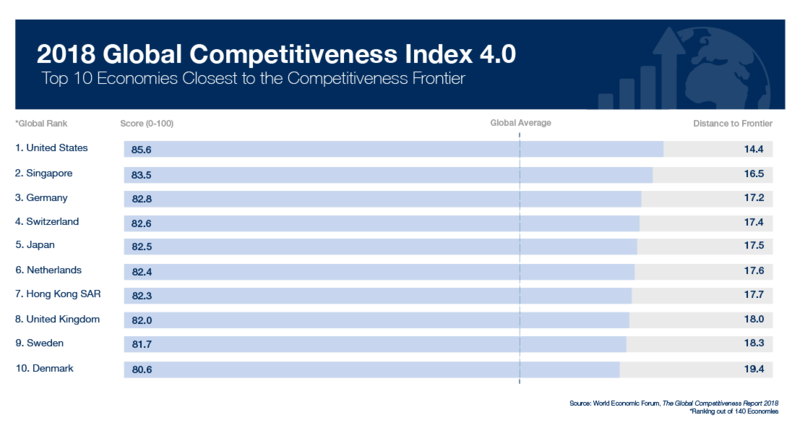 The new index measures 140 economies against 98 indicators, organized into 12 ‘pillars’ or drivers of productivity, to determine how close the economy is to the ideal state or ‘frontier’ of competitiveness. Competitiveness is not only associated with higher incomes, but also better socioeconomic outcomes, including life satisfaction. Explaining the new approach to measuring competitiveness, Thierry Geiger, Head, Research and Regional Impact, Future of Economic Progress at the World Economic Forum, said: “Productivity is the single most important driver of growth in 2018. With the Fourth Industrial Revolution in full swing, there is a need to rethink the drivers of competitiveness and therefore of long-term growth. But there were several areas which showed it still has more to do. It notably drops behind other advanced economies in the health pillar, with a life expectancy of 67.7 years, putting it in 46th place. And it was far from the frontier for checks and balances (40th place), judicial independence (15th) and corruption (16th). One of the key findings from the report is that all economies could do better in certain areas. For example, while Singapore might be the most ‘future-ready’ economy, Finland outdoes it for having a digitally skilled workforce. And while low and and middle-income economies can leverage technology to jumpstart growth, the report emphasises the importance of ‘old’ developmental pillars, such as governance, infrastructure and skills. Worryingly, of the 140 economies surveyed, 117 still lagged behind for quality of institutions, which impacted their overall competitiveness. There was also widespread weakness at mastering the innovation process, with 103 countries scoring lower than 50 when it comes to following through from idea generation to commercial product.